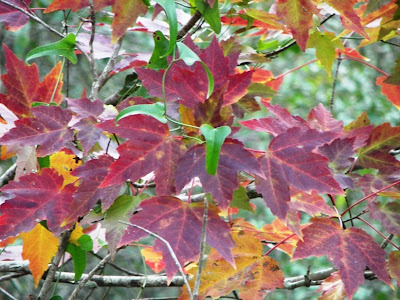 One of our favorite walks here in Fort Myers is the boardwalk around Six Mile Cypress Slough. It warmed up enough in the afternoon one day last week that we decided an outing was in order. Bill got the sighting and pictures of the day and the next five shots are his. Just look at this gorgeous bird! 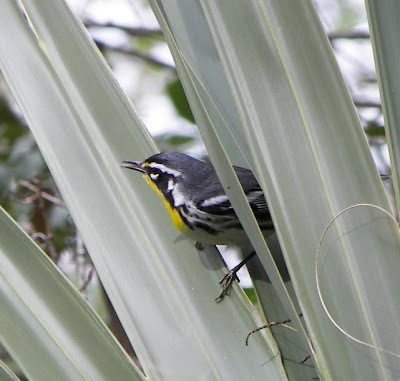 It is a Yellow-throated Warbler and neither Bill nor I had ever seen one before. Bill takes a more artistic approach to his pictures. 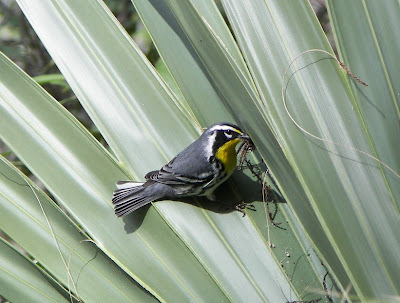 And he likes to try and photograph birds in flight. 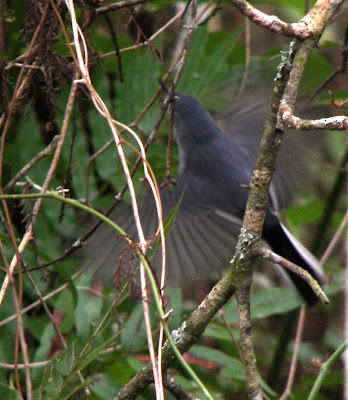 This is a Blue-gray Gnatcatcher and I think the bird just decided to fly before Bill got the shot. We see lots of birds at the entrance to the boardwalk. 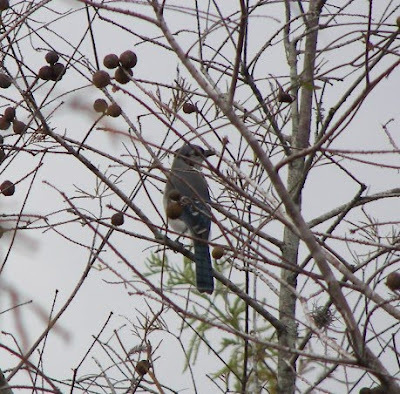 That's where Bill took this picture of a Blue Jay. Don't you agree that Bill needs his own blog? 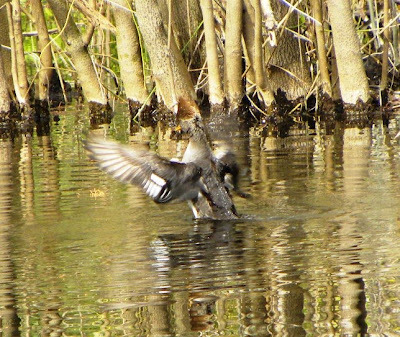 The Hooded Mergansers are back on the smaller lake. 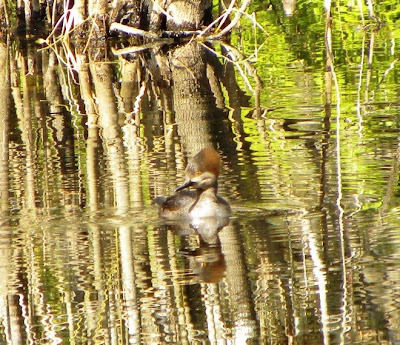 The day was bright and the reflections on the lake played havoc with my pictures. 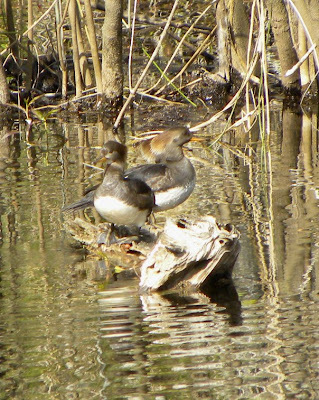 Since these birds are not sporting adult plumages, I can't tell the males from females. 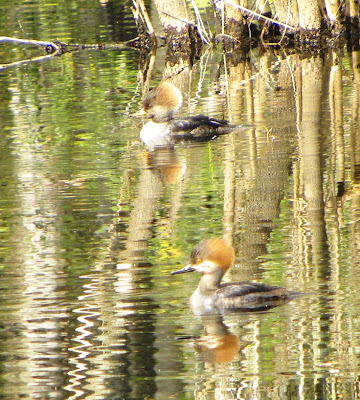 I suspect these are juvenile males and their bouffant head dress will turn the dramatic black and white that we saw on the male hiding in the weeds. 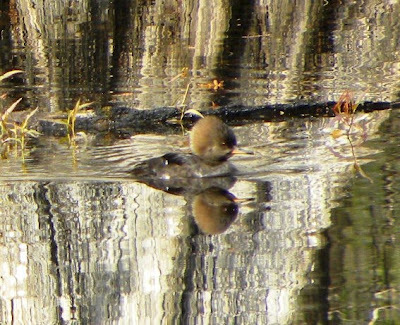 My "Waterfowl of Eastern North America" book says males have yellow eyes and the female's eyes are dark. We watched several of the ducks dancing on the cold water - splashing and looking like they were having a great time. I don't know if the dancing was some kind of display or if they were just playing. 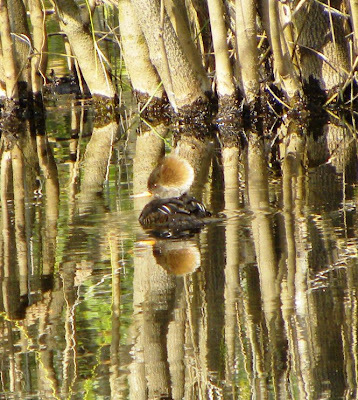 Ducks out of the water look entirely different than when they are swimming. It reminds me of all our friends at the pool that we get to know as "bobbing heads" but we can barely recognise them with clothes and bodies. 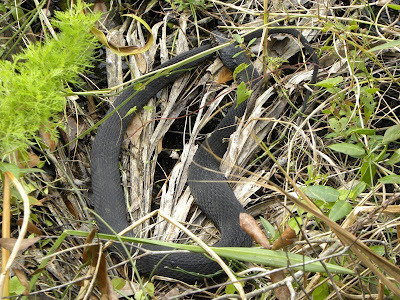 This black snake was beside the boardwalk. He wasn't moving so we are not sure he was alive - and we didn't stay around long enough to find out. 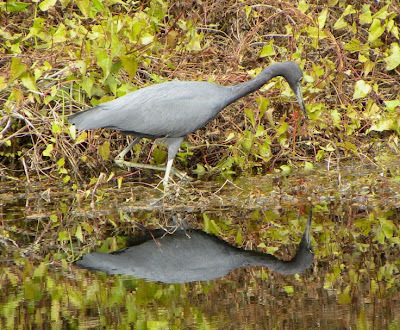 More reflections - this Little Blue Heron looks like he is checking his feathers, making sure they are in place. 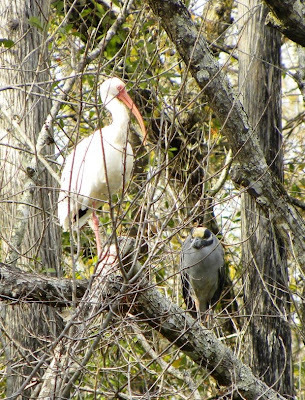 It's odd to see two different species together like this Ibis and Yellow-crowned Night Heron. The heron actually climbed further up into the tree and sat next to the Ibis while we watched. 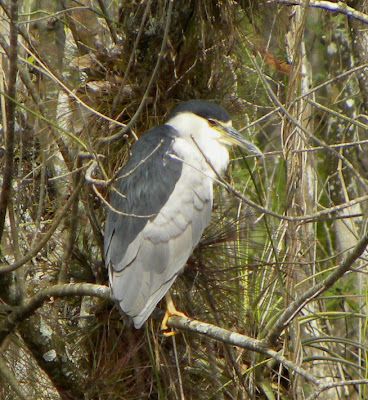 This grumpy old man is a Black-crowned Night Heron. 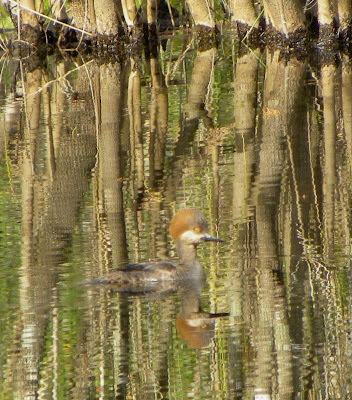 He was in his usual position on the side of the lake.